A brace is a hand tool used mostly for boring holes. Seen even thirty years ago as old fashioned it was the only real tool for the job of removing large screws from the hardware on Leda’s deck and rails, some of which were #28 (7/16″ diameter shank) and six inches long. When I started the restoration work on Leda the internet was not what it is now, and most shopping was done by catalog, by phone or in person. The flat bladed bits that were big enough to fit these huge screws were fairly common about the time that WWII ended. Finding them when I started my work on Leda was a process of going to junk shops and searching through old tools. 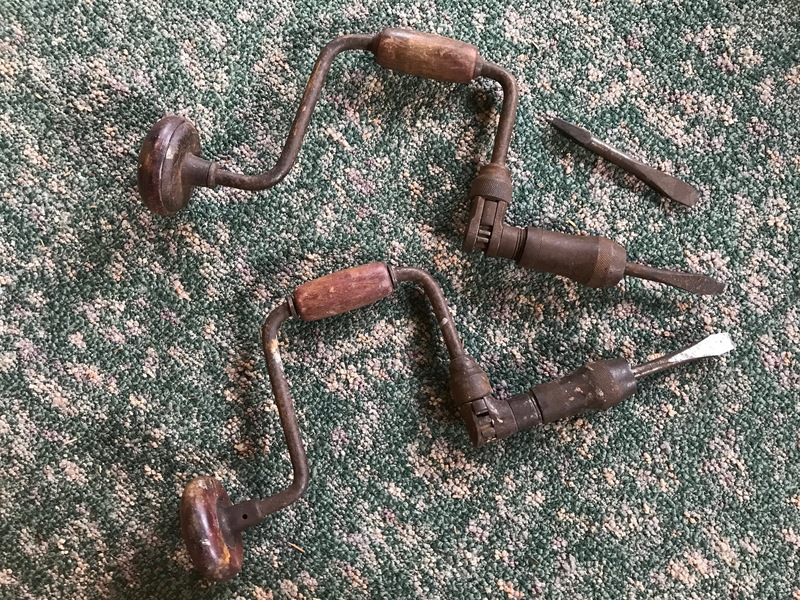 I got started on my collection because there were still enough “old timers” around that had this kind of stuff in their tools who were willing to help me out. Now most of those guys are gone. I wonder how many of these old tools have ended up in the bin because a younger generation didn’t understand the usefulness. Even with the internet they can be a little difficult to source. To do the job right, a number of them are needed in various sizes to fit as exactly as possible the size of the slot in the screw. Otherwise one is in danger of damaging the screw and having to resort to destructive methods to remove it. It is important that the bit have good square corners and parallel sides. They can be reconditioned with a little patience. It is also possible to hollow grind the sides slightly so as to leave the “points” prominent. This can help when the screw slot is damaged. I also found a Dremel tool with a small bit very handy for cleaning out slots. A couple of my old braces. Well used, sturdy and simple tools. I suppose there might be people reading this that don’t know what this tool is so I will get a little help from Wikipedia. Click here to see a brief discussion of braces. It used to be easy to find these. Most any yard sale would have at least one with a pile of bits. The vintage ones are typically made of high quality steel with exotic hardwood handles. Now they are cheaply made and the vintage ones are harder to source. But a trip to eBay reveals that you can still buy them for a small investment. There are of course collectible tools which are outside the need we are discussing. Nor am I the guy to educate anyone about the history of boring tools, but it is a long and interesting history. As for a brace, the upper pad can be gripped in your hand while the lower is used to crank, or you can get your shoulder on the upper pad and use both hands on the crank and really put the BTUs into it. In my case I often ended up with the pad in the center of my chest while I used both hands on the crank. I walked around for months with a sore spot on my sternum. Most importantly, you can feel what the screw is doing. Nothing drives me quite so insane as watching someone strip out a screw head or snap off a shank because they want to save time by using a cordless driver to run in large screws. These same people would not stand a chance getting the bronze screws out of an old boat. It takes patience. And the heat gun. Removing screws from wood using heat takes patience. It is common to use a torch on things made from steel to heat them up. But a torch is too hot to use on wood as you are more likely to char the wood than to heat it to depth. The expansion and contraction of the pieces helps to break the bond between the two. If the metals are dissimilar the different expansion rates help this process along. The same thing happens with wood, particularly if it has moisture in it. Wood expands rapidly compared to steel or bronze. Additionally screws are often set into wood using compounds to seal out water. Old compounds are often dried out and hardened. The newer generations of compounds are closer to glue. Heat helps to soften these compounds. Wood screws are also tapered, so getting them started to back out is usually all it takes. The process for me when removing Leda’s gear was to put the heat gun in place on a stand so that it directed its heat at the area I was working on. It needed to be far enough back so I could walk off and leave it without coming back to charcoal. Then a periodic check with the brace and bit would tell the story. These screwdriver bits are indispensable for anyone working on a boat (vintage or not). They are perfect for setting large screws as well as removing them. Philips head screws are more common now than when braces were in their prime and large Philips (cross) bits are hard to find. But they are out there. And are a worthy item to get into the tool box. These are the original cordless drivers. One of the things that saddens me is that I realize I have become a niche market for manufacturers. Even the paint used on wooden vessels is something of an anachronism. Most boats do not get painted these days. It’s easy to think with the internet that whatever we need can be searched out and sourced. I’ve been shocked a number of times in recent years to discover that some of the things I think of as common are now somewhere between hard to find and extinct. Manufacturing processes have changed and old stocks used up. This seems the way of the brace and bit.